My bestie Cathy Keisha has been having so much fun with her Foto Frenzy posts that I thought we should horn in on the action. Here's how to play: Just pick a number between 1 and 1,111. (That's how many photos Gloman has taken of me...ok, a few of Glogirly's crappy shots may have slipped in there too.) We'll post the photos you pick and give you a behind-the-scenes True-Townhouse-Story about each photo. We won't hold back a thing! Ok, I'll start. At the beginning. This is the VERY FIRST picture Gloman ever took of me. It was on my first night at the townhouse a little over seven years ago. I came from the St. Francis Animal Shelter in partnership with PetSmart. Gloman adopted me as an anniversary gift for Glogirly. A sign of TRUE LOVE, since he still claims to be more of a dog person. Seriously, give it up already, Gloman! I believe you were wearing a tee shirt with a CAT on it all weekend! 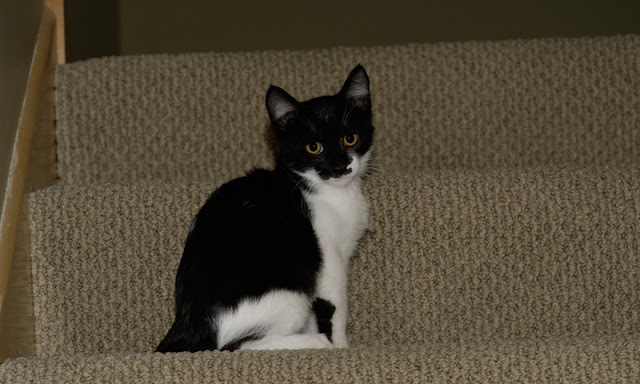 I had been in my new forever home for just a few hours and was exploring the steps....three whole stories in this townhouse! I still love twirling on them. From my very first photo, I think you'll see that I had already mastered the art of melting hearts and getting pretty much anything I wanted. I still know when to play the cute card. I am SPEECHLESS at the cute you have even at such a young age!! That is a precious photo of you, Katie! Let's see... I will pick... number 881! I would love to do Foto Frenzy on my blog, but my photos aren't numbered in any recognizable order! And there are thousands and thousands in monthly folders. I would not know where to start! You're such a cutie ! Oh were you ever a cutie! Gotta see another early one... how about 25! Oh my! Wait till Brad sees this baby pix of you...hmmm....I pick 1,111. purrr...meow! How fun! We'll pick 228! How cute! We thinks the mum may have taken million squillion pictures of us. All of the crappyerty crap crap. We would love to hear the story behing picture number 666! Interesting! We would love to hear about your 1,000th photo! 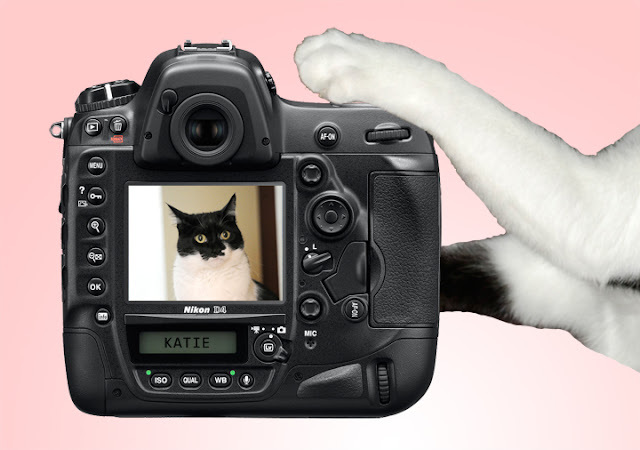 I love that itty bity Katie photo! I pick 106! Awww, you almost look sad there, Katie. We pick 441! Thank you for the offer of the Halo foodies. Never had any. Does YOU like it? I shudder at this because if I count ALL of my goat photos I have over 15,000 of them. That is a lot of goat photos. Katie...you were a cutie...stil are! This is a fun game! We may have to join in too! We pick 634! We want to know about # 728, that's a special number for us! OMC, that first photo! Priceless! We'd like to pick number 941. This is such a cool idea!!! How about... yu87? I used my cat Peck's paw to type in the number. Minus the letters, I guess that's 87. Easy to see after that first photo that everything else was down stairs, er... down hill. I meant to write down hill. Katie, you're so adorable, of course you got scooped right up! I pick number 482! 999! I was surprised that so many chose low numbers. That foto is adorable. After I was in the condo for a few hours, I was still UTB. This is so cool - we will choose...number 253. Maxwell: Dood. You chose that on CK's blog too. I keep telling you, it's not a legit number. FaRADaY: *airy paw wave* details. since when did THAT ever stop me? Allie: Wait. What's the numerical value of PINK?? We like kitten photos, so we pick 13. Thanks for your sweet words today, my darling. You are pretty darn beauteous yourself, you know. XOXOXO And you have been a wondrous Cat Ruler thus far---the King approves! YOus is a gorgeous cat even was spectacular when yous was a kitten! And me has a fondness for 4 digit numbers! If I divide 1,111 photos by 7 years I get 158.71428571428571428571428571429, so anything between 1 and 158.71428571428571428571428571429 will probably be in that first yer. You were adorable in your very first photograph and it is easy to see you have Gloman under your paw. Katie you were just as adorable then as you are now....you have that amazing look that has never changed!